The First Book on This Series in 10 Years! FOUNTAIN VALLEY (13 July 2009)— The Barber Dimes: a representation of maturity that is often overlooked in the ever-changing rare coin market of the 21st century. The market is sorely in need of this reference that provides a study of all the critical aspects of this series. Many collectors and investors have eagerly awaited a publication on Barber Dimes. To help expand numismatic knowledge and increase the understanding and appreciation for this series Jeff Ambio wrote his book Collecting & Investing Strategies for Barber Dimes. •	Covers every proof and business strike from 1892-1916. •	Each chapter covers physical characteristics, pricing data and brief histories. •	Ambio provides suggestions for building a meaningful investment portfolio. •	Includes observations on third-party certifications. •	Suggests places in which to buy and sell Barber Dimes. Jeff Ambio is a widely read numismatic author. His writings and articles are credited with groundbreaking work in the field and have appeared in numerous publications. Collecting & Investing Strategies for Barber Dimes is the first comprehensive book published on this important series in nearly 10 years. Including mintage figures, rarity rankings, important varieties, a detailed physical analysis of each coin, and significant examples, this new release will enhance the numismatic industry by updating and informing collectors on the Barber Dime series. 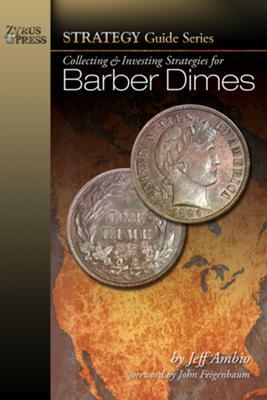 Collecting & Investing Strategies for Barber Dimes is scheduled for release August 2009. Please call if you wish to request additional information. His book will be available online at www.amazon.com and www.zyruspress.com. Media contact: Zyrus Press Publishing, at www.zyruspress.com.